Michael Sembello began his career as a professional musician by becoming a studio guitarist. He did session work for artists like Michael Jackson, Diana Ross, Barbra Streisand and Donna Summer. In 1983, he released his debut album 'Bossa Nova Hotel'. 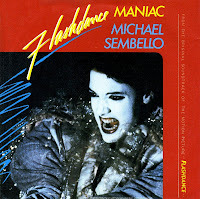 It included the track 'Maniac', which was selected for the soundtrack of the movie 'Flashdance'. It gave him his first (and last) international hit. A big hit like that is often the kiss of death for a pop artist. These days, Sembello's career has been focused on Eastern music and spirituality.